Pune, January 20: When seven-year-old Kenisha Gupta set foot in the swimming pool for the first time, it was more of an endeavor by her parents with the aim of eventually getting her to sleep. Their plan worked, as an energetic and restless Kenisha slept peacefully only after a long session in the pool. Water made Kenisha calm. Little did they know that their daughter would go on to become one of the most promising swimmers in the country. Kenisha won three gold medals at the Khelo India Youth Games, in the 200m medley, 50 freestyle, and 100m freestyle events. 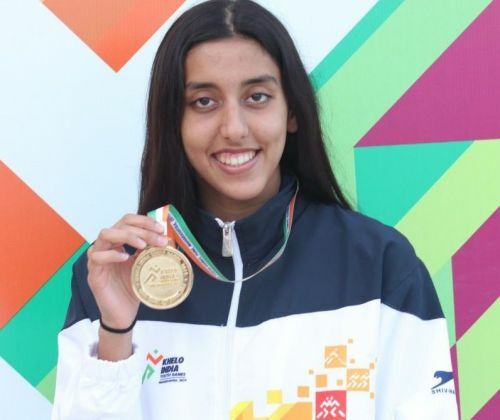 Kenisha, who was initially a breaststroke swimmer, began training under former national coach Kishan Singh who always pushed her to pursue the other strokes as well. He believed that every stroke compliments the other and being an all-round swimmer would help Kenisha grow. She then tasted early success at age nine when she won her first national medal in the 50m breaststroke event, after which there was no looking back. She built on that and went on to do wonders, winning more national medals in years to come. Kenisha was a multiple medalist at the Khelo India School Games last year, where she won four gold medals. She now trains at the Otters Club in Mumbai under the watchful eyes of coaches Sandeep Sejwal and Vinod Nair who have helped hone her skills. Kenisha utilizes her summer and winter breaks from school to train in the United States as that was something former coach Kishan Singh always urged his talented trainee to do. Maharashtra’s swimming coach at the KIYG, Balaji Kendre, also applauded Kenisha’s efforts that brought gold medals to the state. He spoke about the dedication she has towards the sport and focused on how Kenisha, at only 15, is better than many other swimmers competing in higher age categories while also backing her to win medals at international events in time to come. The Mumbai girl believes in taking things ‘one step at a time’ as she chooses not to talk or think about competing at the international level. “I definitely want to be a professional swimmer for as long as I can, but living in the present has helped me greatly and I will continue to do so,” concluded Kenisha who seems very sure of herself, be it inside or outside the pool.